This superb detached villa is situated on the front line on the cliffs edge on a private secluded 900 metre plot. It is ideal for up to 8 persons seeking privacy in prestigous surroundings but within convenient distance of Los Gigantes. 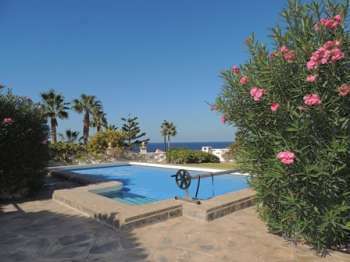 Recently refurbished four Bedroom four bathroom villa in the exclusive Club complex with fantastic views of the sea,cliffs and La Gomera. This stunning front line seven bedroom six bathroom villa is situated on the exclusive Calle Adelfas road.It has a large private terrace with panoramic views and a heated pool. Definitely the Wow factor. Exceptional five bedroom Villa situated over three floors with a lift giving easy access to all floors.Large outside terrace and heated pool.